One of the rarest breeding British birds was spotted nesting on the rear wall of the office during the last week of July 2011. A breeding pair and 2 chicks were summering in sunny Shoreditch and happened to like the look of the area of flat roof directly outside of Dan Fisher’s desk. One of probably only 50 breeding pairs in England at any one time, this was quite a spot. Sam (a keen twitcher, (actually ‘amateur ornithologist’) apparently there is a difference??) 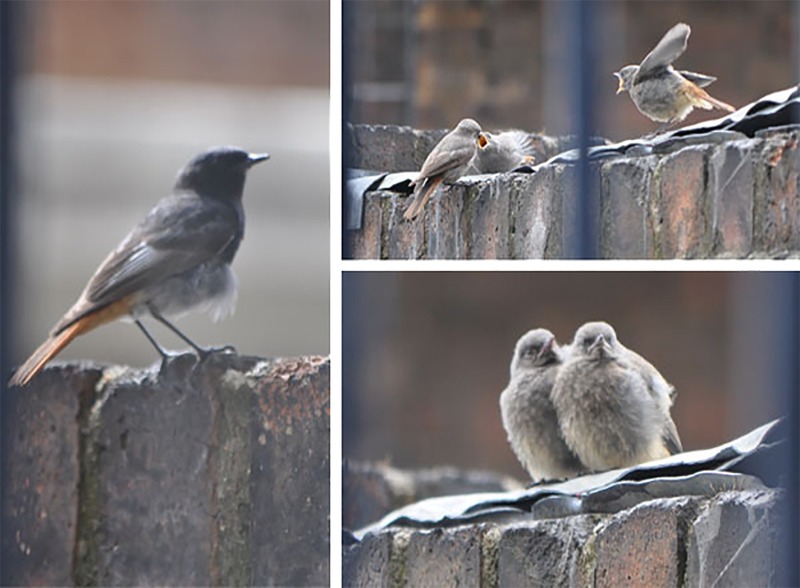 gave an eye-ball verification that the family were in fact Black Redstarts. The rarity of the find, lead to a lot of photographing of the birds and a spate of high fiving in the office. Apparently the bare brick walls and relative shelter of the cluster of buildings forming our rear courtyard, in some ways represents their normal central European cliff top habitat? I think this is stretching the truth – they just came for the nightlife!